Lauren has a strong background working with leading consumer brands, and brings a wide variety of expertise to her client accounts including a passion for consumer marketing, media relations, influencer engagement and event planning. 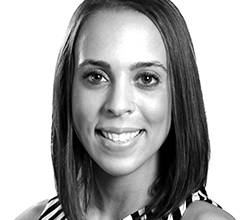 Lauren works on the Keurig, Lindt and Eastern Bank accounts, in which she collaborates with teams to develop and execute strategic, integrated campaigns, with a focus on media and influencer relations planning and outreach. Prior to joining Cone and moving to Boston three years ago, she held an account supervisor position at Edelman New York where she worked on the Dove beauty account for several years, playing a key role in the development of media strategies for brand marketing campaigns across the Dove Hair and personal wash categories. Highlights include driving plans for the Sundance Film Festival, managing an international three-day media event for 75 editors on behalf of Unilever beauty, and maintaining trusted relationships with top-tier media. Before Edelman, Lauren worked at DEVRIES GLOBAL on the Pantene Pro-V business.